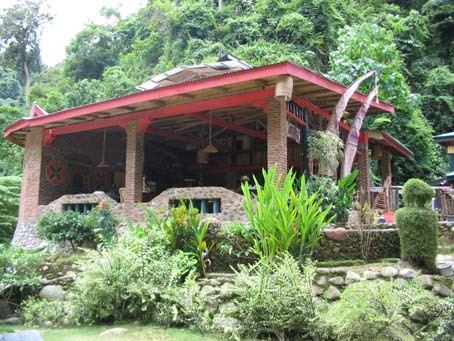 The Jungle Inn is located at the top end of Bukit Lawang. Follow the path upstream of the Bohorok River around a 20 minute walk from the start of Bukit Lawang. It is located right next to the river crossing across to the Bohorok Orangutan Rehabilitation Centre. 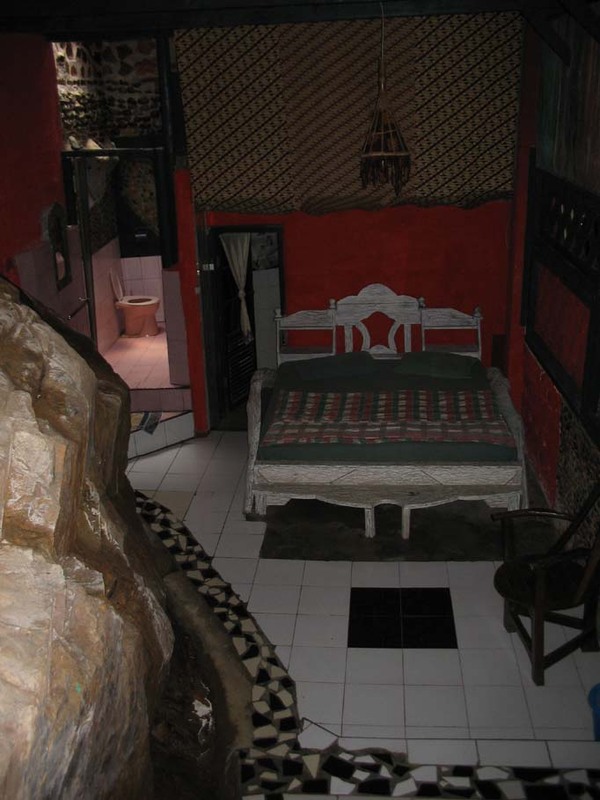 Each room at the Jungle Inn has a different look and feel. 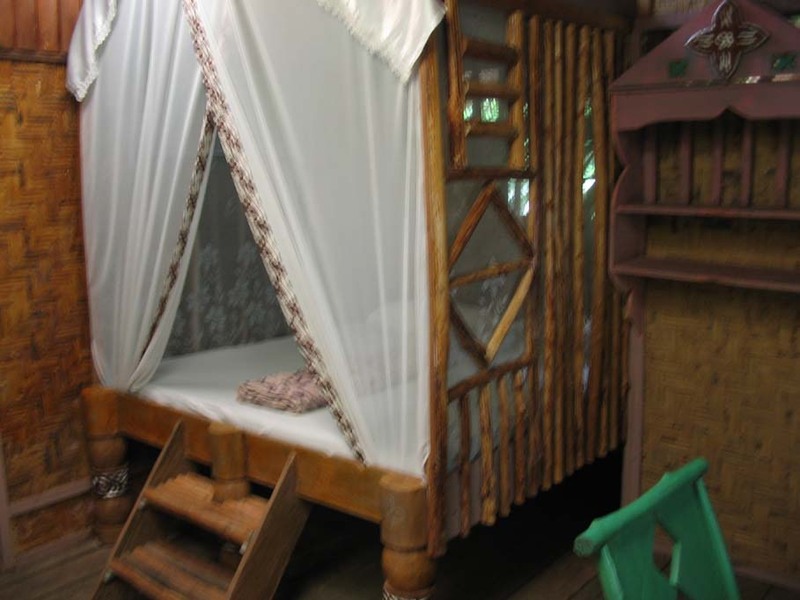 Prices range from 250,000Rp to 500,000Rp per night. 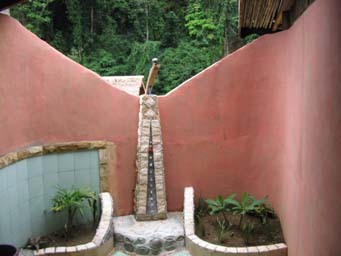 Some with open jungle bathrooms where you can look up at the jungle and sky while taking a shower. 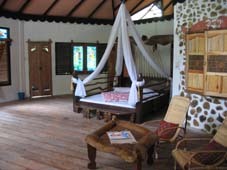 Honeymoon Suite (2 rooms available) - 500,000Rp per night. This room is right at the top with a large balcony overlooking the river and jungle. 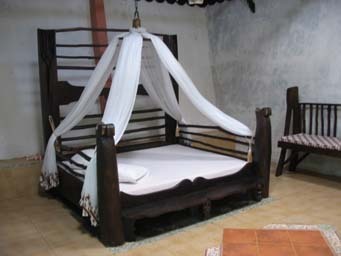 A large four-posted bed, mosqito net and jungle bathroom. There are 2 Honeymoon Suite rooms. River View Suite (2 rooms available) - price is 450,000Rp per night. Jungle View Suite (2 rooms available) - price is 400,000Rp per night. 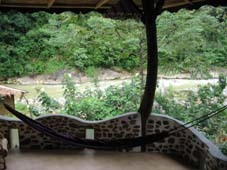 Large balcony overlooking the river and jungle, a rear balcony with hammock, large four-posted bed with mosquito net. There are 2 Jungle View Suites. 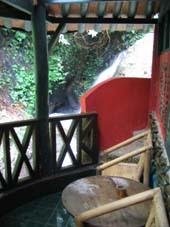 Waterfall room - price for Room A 300,000Rp Room B 250,000Rp per night. 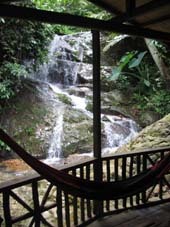 2 balconies, 1 at the front overlooking the river and jungle and one at the back overlooking a waterfall. Sumatra Travel now have available package tours to Bukit Lawang which include return car transfer from Medan to Bukit Lawang, Jungle Trekking and accommodation in Jungle Inn. For more details click here. We stayed in the Jungle Inn for 3 nights in November 2012 and had a fantastic time. We wanted to stay here for longer and felt sad when we were leaving because of how welcoming all the locals had been. Our jungle treks were organised by Obiwan, Jacka and Simon from the Indra Inn, and were an amazing experience. We had loads of fun with them and they really looked after us. Would definitely like to go back to Bukit Lawang. 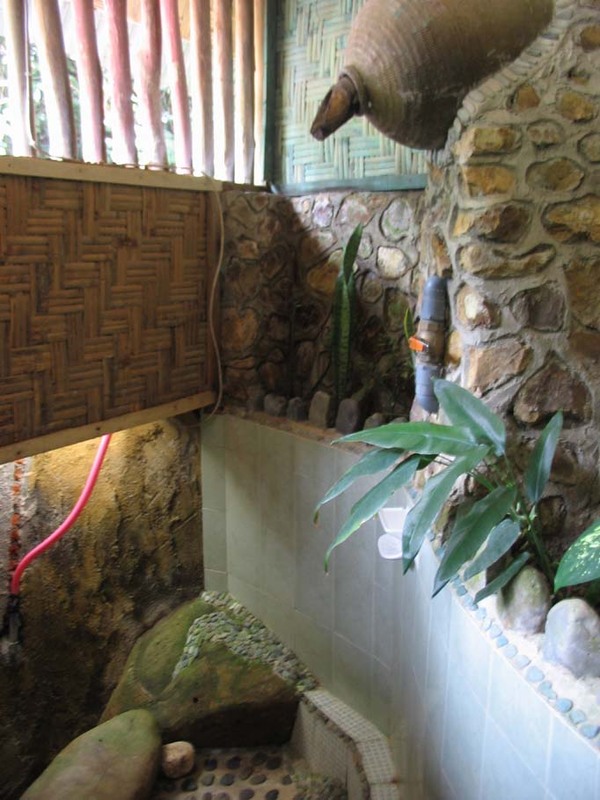 Outdoor bathroom in the Jungle Inn was great fun! Showering under the open stars listening to the monkeys and the other sounds of the jungle - priceless! to get back there. You can book by contacting Rahman on +6281375324015. helped a lot with our 4 yr old, so we could have hands free for cameras etc. from Medan, too - use it, as any other transport would be awkward. With pleasure I will recommend Jungle Inn. We had a fantastic time and met up with Rahman and Darwin our jungle trek guide. In the morning we already saw the orang utans walking next to the river which you cross by a little canoe to get to the jungle. The food is fantastic (everywhere in this little city though) and we absolutely enjoyed our stay here. Bring mosquito repellent, you will need it! 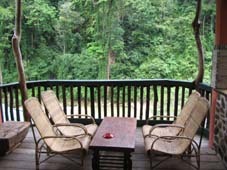 The Jungle Inn is just an amazingly relaxing and tranquil place to rest, relax and enjoy the views of the jungle and river. 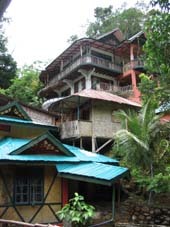 My Beautiful wife and I spent our honeymoon in Bukit Lawang and stayed at the lovely Jungle Inn. The hospitality and friendliness was just amazing. We will be back for sure. The Jungle Inn is awesome. 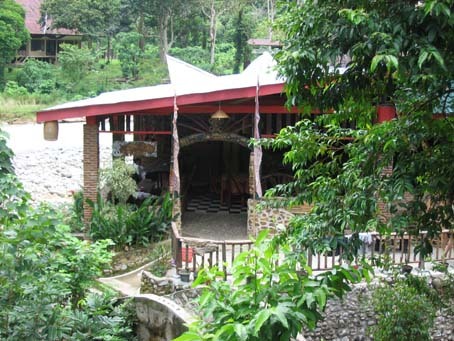 The best location in Bukit Lawang just across from the Orangutan centre. The rooms are amazing. 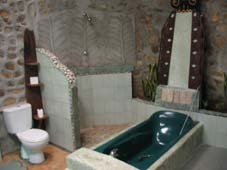 If you can stay in either the Presidential Suite or Honeymoon rooms with jungle bathrooms! Watch the monkeys while taking a shower. Have you stayed at Jungle Inn?